© 2008 Peter Serling. Courtesy of Julia Wolfe. In March, in a Q&A session following a stunning performance of Julia Wolfe’s Anthracite Fields at the Kennedy Center, an elderly woman stood up to announce her close connection to the material of the Pulitzer Prize-winning work, an oratorio that meditates on the history of coal mining. The granddaughter of a miner, the woman asked Wolfe if she had visited the Pennsylvania Anthracite Heritage Museum (the composer had) and sent greetings from a new mutual friend in the northeastern part of that state, whom Wolfe had interviewed in the course of researching the piece. Such an interaction might seem foreign to the red-carpet pomp of the Kennedy Center, but it felt like an entirely appropriate response to the music of Wolfe, a composer who has consistently sought to create friendly encounters with unfamiliar music. With her organization Bang on a Can—co-founded with composers David Lang and Michael Gordon—she has fought to make the world of contemporary music accessible to those beyond its specialist confines. What started off as a do-it-yourself marathon concert in the Lower East Side in 1987 has since expanded into a multi-million dollar outfit that oversees a new-music ensemble, a marching band, a record label, and a commissioning fund, and unfailingly advocates for the new. That intensive engagement with historical materials has become typical of Wolfe’s compositional process. In the 2009 work Steel Hammer, composed for the All-Stars and the Trio Mediaeval, she fuses more than 200 versions of the classic folk ballad of John Henry, with music that intertwines Appalachian folk, medieval descant, and rock; for Anthracite Fields, she visited the coal mines, interviewed retired miners, and sifted through oral histories. Wolfe’s next major project, Fire in My Mouth—her first commission from the New York Philharmonic, which will debut under music director Jaap van Zweden’s baton in January 2019—is a multimedia meditation on the 1911 Triangle Shirtwaist Factory fire. Her start as a composer came relatively late. Wolfe flirted with being a Joni Mitchell-style singer-songwriter in high school, played in an all-female drumming group at the University of Michigan, and turned towards formal music studies only after taking an elective with a particularly open-minded teacher. Following a tough battle with another professor who sought to turn her into a serialist—a rite of passage for composers of her generation—Wolfe arrived at the more open-minded environs of Yale in the mid-1980s, just as the school had become a powerhouse for young orchestral superstars like Aaron Jay Kernis. But having already befriended Lang and married Gordon, she aligned herself less with this symphonic school than with the upstart, renegade ethos of figures like Steve Reich and Philip Glass. She moved downtown and helped launch the first Bang on a Can marathon, a ten-hour concert that abandoned buttoned up conventions to attract an audience broader than the typical new-music crowd. It was Wolfe, by the way, who came up with the organization’s irreverent name. Bang on a Can’s freewheeling marathons—originally billed as an “eclectic supermix of composers and styles from the serial to the surreal”—provided a space for different idioms to coexist, and Wolfe’s music increasingly evinced such heterogeneity. Captivating early pieces like The Vermeer Room and Four Marys draw together impressionistic subtlety with a pulverizing postminimalism indebted to the Dutch master Louis Andriessen. She was the first of the Bang on a Can trio to compose a work directly for its amplified All-Stars ensemble with the funk-imbued Lick, which funnels the extroverted energy of James Brown into fitful grooves. 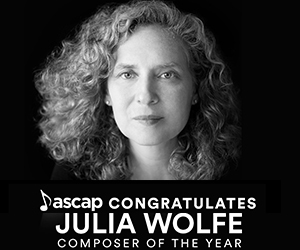 Since 2009, Wolfe has taught at New York University, and is known for her supportive attitude there and at the summer program for young musicians that Bang on a Can runs at MASS MoCA. Today, Bang on a Can’s work spreads across multiple genres, presenting music by everyone from the Russian avant-gardist Galina Ustvolskaya to Sonic Youth’s Thurston Moore. Perhaps the clearest sign of the organization’s mainstream success is that the All-Stars were featured in an episode of the PBS children’s cartoon Arthur in which Wolfe was animated as—you guessed it—a wolf. William Robin is assistant professor of musicology at the University of Maryland. He writes about contemporary music for the New York Times, and is currently researching a book on the history of Bang on a Can.